Way back in the day, before I ever even had a driver’s license, I went to numerous NASCAR races in the Southeast with some of the most loyal Ford fans you’d ever want to meet. Brothers Wesley and Weldon Stubbs were the kind of people who truly would rather have pushed a Ford than driven a Chevrolet. When we went to Daytona or Darlington or Charlotte or Atlanta, we went to see David Pearson and the Wood Brothers’ No. 21 Mercury. More often than not, we had something to celebrate on the way home, even though there were no big drinkers or party folks in our crowd. Later, when I started reporting on races, I had to put my old fan gear away and try to treat the Woods like any other team. But like anyone else in the NASCAR media, I never could quite do that. When you need a quote from an owner, Eddie or Len Wood could always be found and counted on to cooperate. Even in the lean years between victories, they were ready to answer questions. A few years ago, they failed to qualify for the Daytona 500 but were still there on Sunday morning, hosting sponsors and talking to the media. day. It was painted in the old colors from the Pearson days, and somehow it seemed like all the years in between Pearson and Bayne had simply gone away. The old No. 21 was back where it belonged. Bayne seemed to sense that, even though he was nearly 15 years away from being born when Pearson won the 1976 Daytona 500, the Woods’ fourth Daytona 500 triumph. As he surveyed the scene in the garage after the Duels, he looked over at his crew hard at work repairing the car he’d damaged in a last-lap crash in the 150-mile qualifier. And he listened as crew members stopped by to congratulate him and the Woods on their strong run in the qualifier. “This is cool, ain’t it?” he said. I began to imagine what a great story it would be if the polite and courteous rookie Bayne could take the Woods back to Victory Lane. But since I tend to be somewhat of a sentimental old fool, I didn’t dare think too seriously about it. But then on Saturday morning, I stopped by the breakfast table at the little country store near my house. Marvin Williams, who knows far more about short track race cars than most people in the sport today, talked as if Bayne had a realistic chance of winning the 500. 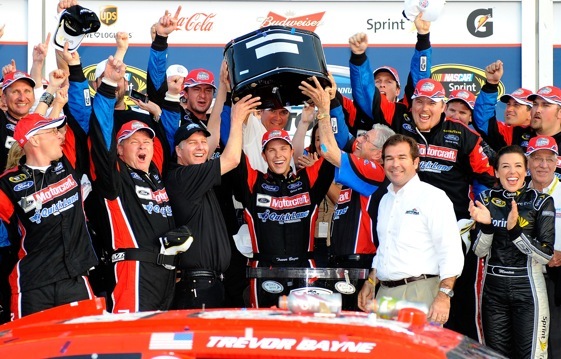 I knew then that a Bayne victory wasn’t as far-fetched as it might have seemed. After Bayne won, I felt like the NASCAR I once followed so loyally as a fan had come back to me, but I’m in the older demographic, and what warms my heart might not do the same for the next person. But everywhere I go and everyone I talk to in person, on the phone and even on Facebook, is similarly excited. Some of it is because Bayne seems to be a true man of faith, as evidenced by his comments in his winner’s interview, where he said that winning the Daytona 500 isn’t the biggest thing that’s ever happened to him. “The biggest thing I’ve ever done and ever could do is just finding Christ,” he said. “That’s the biggest thing. That’s the reason I’m here. That’s my whole platform. “He’s put me here for this reason. I didn’t even lose it for the 500 win, but that almost made me lose it there. If it wasn’t for that, there is no way I’d be sitting here. That gives us purpose. And his victory brought about scenes that illustrate everything that is good about NASCAR, scenes like the supposedly unbiased reporters in the media center giving Bayne and the Woods a standing ovation. Another scene that stands out is 85-year-old Glen Wood, founder of the winning race team, being escorted to Victory Lane by the man that once was his chief rival – Richard Petty. Unlike 10 years ago, when we all left Daytona with a feeling that nothing was right in NASCAR, this time it feels like everything is right. I don’t know if NASCAR is smart enough to realize that this is the best thing to happen to them in a long while. I can’t believe it …..it is a little unreal….I have been the diehard defender of the #21 for so many lean years ….and to have a kid from my hometown do this……John Houston taped to Spielberg stapled to Francis FORD Copella could have written this day at the DAYTONA 500……there are many people who have scoffed at my faith in the WOOD BROS over the years who are shaking their heads now. It could not have happened to a nice more deserving team…..